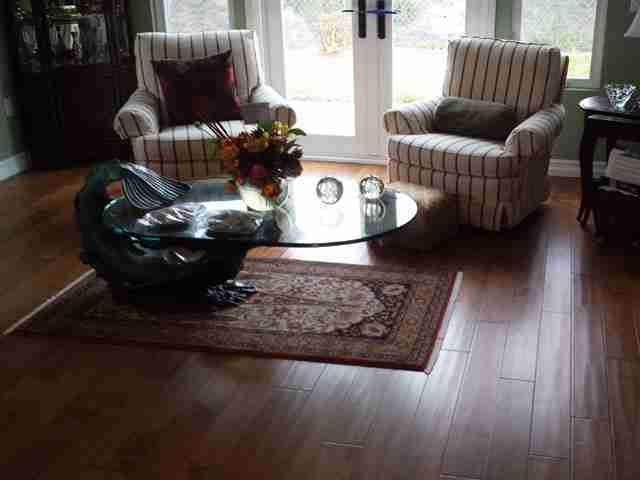 Barbara was shopping for 5″ Maple hardwood in University City when she was referred to us by her architect. 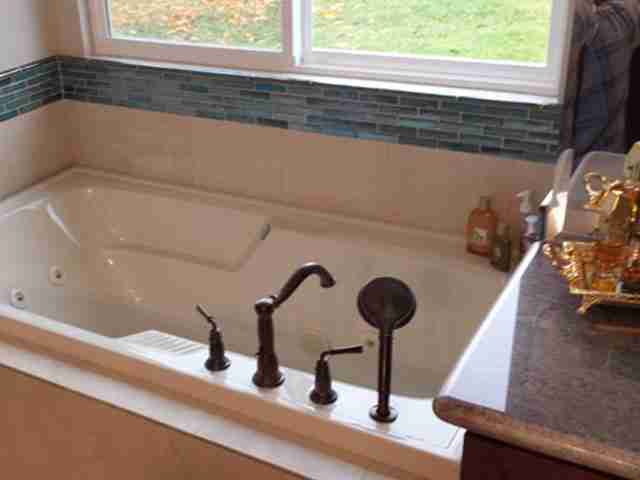 She desired assistance in coordinating all of her flooring finishes with the unique granite slabs she purchased for her kitchen and bathrooms. 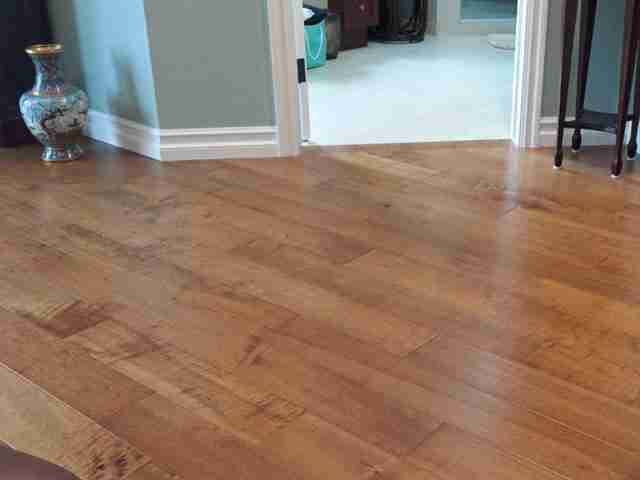 The hardwood floor Barbara decided on is a distressed, engineered maple with a light stain. The warm, golden brown color and textured surface result in a floor that is casual yet sophisticated, natural yet refined. It coordinated nicely with the furnishings and wall colors, creating harmonious interiors. We selected some porcelain tile flooring for the kitchen that complimented her new slabs as well as the custom backsplash and glass tile inset that she picked out at Arizona Tile. 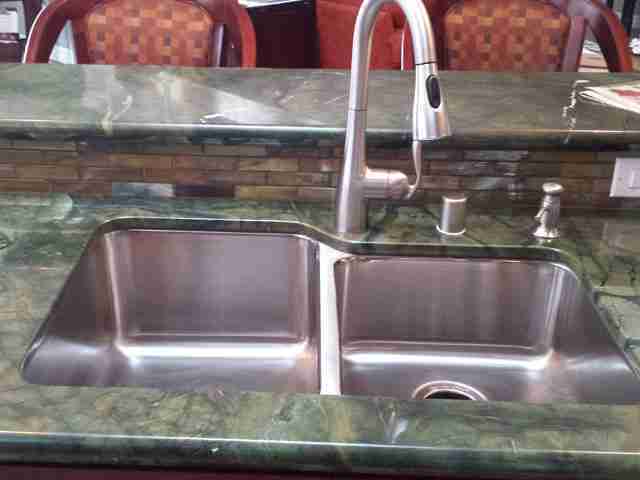 Again, this flooring provides texture and movement while serving as a nice, neutral backdrop for the rich chocolate brown cabinets and stunning green granite. 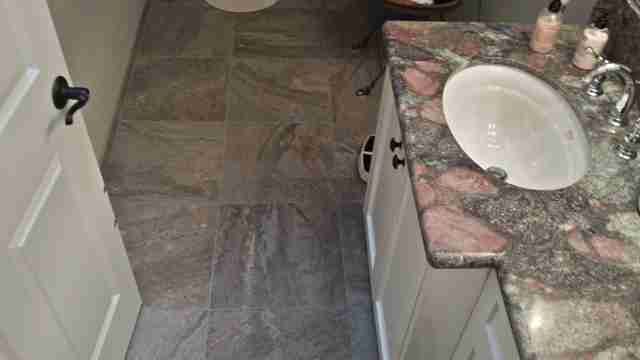 For the guest bath, Barbara selected a porcelain tile with grey-brown tones. 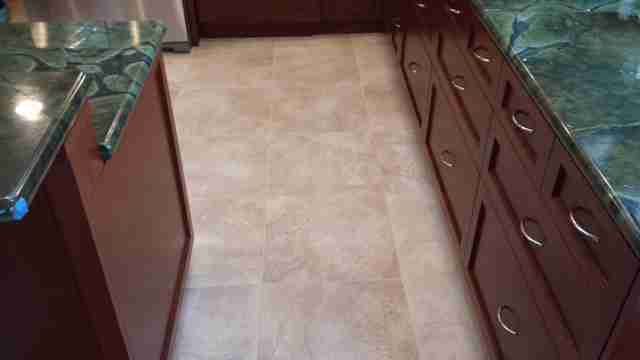 This beautiful tile offers the look of travertine without the maintenance of natural stone. 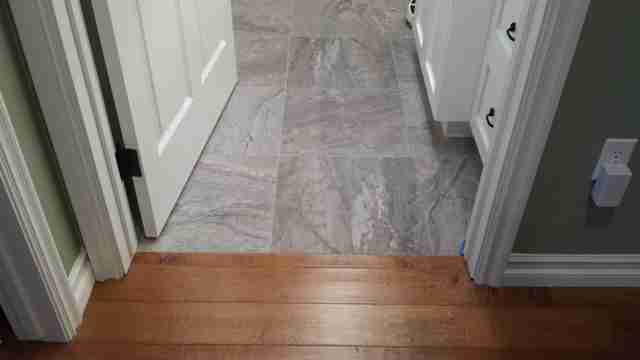 For the master bath floors and tub surround, Barbara chose a porcelain which replicates the look of limestone. 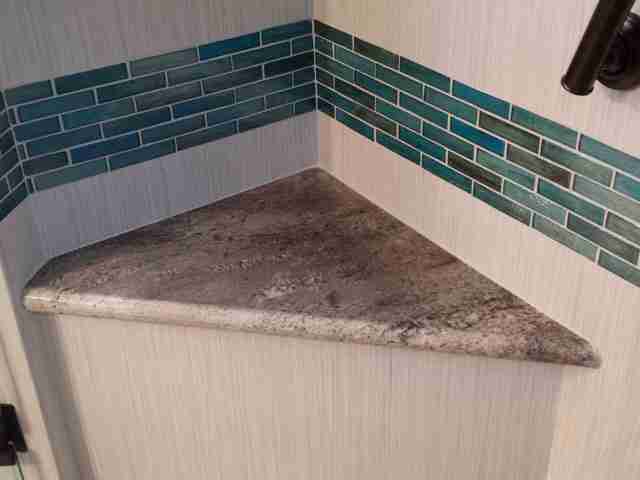 The light color compliments the glass tile feature strips with their varying shades of blue and green, reminiscent of tropical seas. Barbara also requested a custom soap niche and shelves. 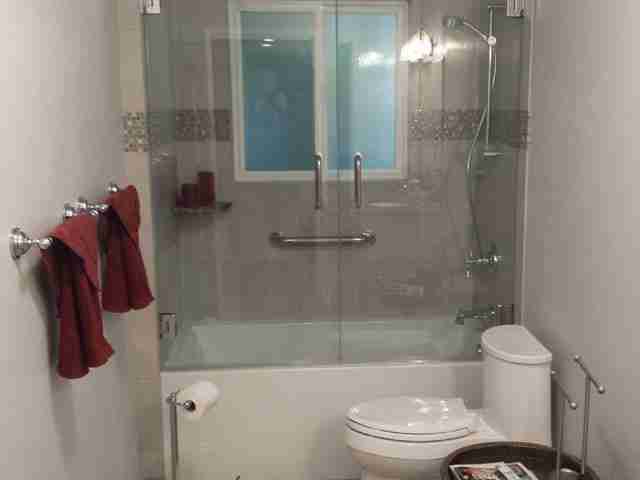 We accomplished this using granite and the glass tile feature strips. The contemporary porcelain tile used on the walls resembles fabric and offers texture without competing with the granite and glass due to its calming, neutral colors. 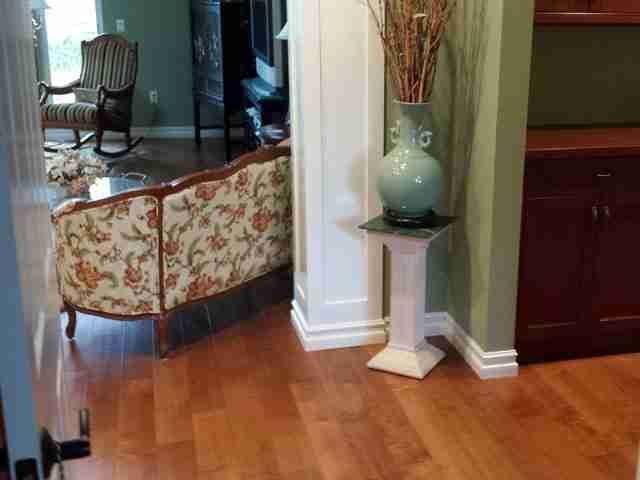 From the photos you can see that Barbara’s new 5″ Maple hardwood really pulls all of her design finishes together.